Greenland, a country under the Kingdom of Denmark located between the Arctic and Atlantic Oceans northeast of Canada has a total land area of 836,109 square miles and a population of over 56,000. Greenland is the world’s largest non-continent island and is also its least densely populated country. Block grants from Denmark, compensation from EU and fishing licenses sale contribute to the economy. Tourism and quarrying are the upcoming sectors. The country is 100% literate. The summer months of June, July and August are considered tourist friendly, for then the country is not freezing. Midnight Sun experienced in June and July makes the days endless. 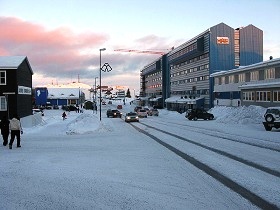 Greenland is best experienced by boat as most towns are situated along the coast. Moreover the marine life and the bergs and glaciers are better when observed from a ship. Guided tours are a better option to understand the country. Visitors also enjoy hiking, mountain climbing, dog-sledding and skiing. Polar bear and musk oxen sightings have never failed to enthrall visitors. Seabirds, fish, musk oxen and blubber are the base for Greenlandic diet, which is influenced by both Canadian and Danish cuisine. This Cold Heaven: Seven Seasons in Greenland 978-0679758525 $13 Author Gretel Ehrlich gives an authentic cultural introduction to Greenland through her seven different extended visits in the 90s with the rest of the book presenting history. Greenland – North Pole Region Map 978-1553418412 $10 Double-sided. The first stamps of Greenland were issued between 1938 and 1946 showing Christian X and polar bear. The set (Scott #1 to #9) catalogs for around $80 MNH and $30 used. Christian X, King of Denmark from 1912 to 1947 spanning both the World Wars, was one of the most popular Danish monarchs – he remained in the capital throughout the German occupation of Denmark, a visible symbol of the national cause. This was followed by another set of nine stamps on February 1, 1945 showing local scenes and Christian X. The set (Scott #10 to #18) is sought after and catalogs for around $300 MNH and a little less for used. The designs show harp seal, dog team, polar bear, Eskimo in kayak, eider duck, and Christian X on his horseback. Christian X took a daily ride on his horse “Jubilee” through Copenhagen until a fall from his horse in 1942 and the design depicts that scene. A variety of the same set (Scott #19 to #27) that are overprints indicating the Liberation of Denmark from Germans on 5th May, 1945 is valued at a huge premium of around $2400 MNH and $1700 used. A long set of eleven stamps released between 1950 and 1960 showing Frederik IX and the Polar Ship “Gustav Holm”. The set (Scott #28 to #38) catalogs for around $110 MNH and $20 used. Frederik IX was King of Denmark from 1947 until his death in 1972. Gustav Frederik Holm was an explorer who was made famous for his explorations of the east coast of Greenland. A set of five stamps released between 1969 and 1976 showing Fauna. The set (Scott #71 to #75) catalogs for around $15 MNH and $6 used. The designs show right whale diving off Disko Island, Narwhal, polar bear, walruses, and musk ox. Several sets showing fauna has been released over the years. The sets (Scott #146 to #147, #148 to #157, #177 to #188, etc.) are relatively inexpensive. A set of six stamps released between 1981 to 1986 in the Marine theme. The set (Scott #136 to #141) catalogs for around $40 MNH and $25 Used. The designs show pandalus borealis (species of shrimp), spotted wolffish, Greenland halibut, capelin, codfish, and Atlantic salmon. A set of two stamps released on October 18, 1990 in the Famous Men theme. The set (Scott #231 to #232) catalogs for around $12 MNH or used. Famous Men Type is a long running series with some sets valued at a sizable premium. For example the set of three stamps (Scott #242, #243, #249) in that theme released between 1991 and 1992 catalogs around $50 MNH and a little less for used. A set of seven stamps released between 2000 and 2001 showing a portrait of Queen Margrethe with the background image showing a representation of Greenland landscape. The set (Scott #364 to #375) catalogs for around $13 MNH or used. Queen Margrethe is a popular theme on Greenland stamps. Starting with the stamp (Scott #69) for her wedding on June 10, 1967, she appeared in several sets (Scott #86 to #97, #120 to #133, #214 to #229, #253, etc) over the years. The sets catalog for a slight premium over other issues from the same periods. Danish Colonial era private coinage was used in Greenland from around 1859. The early issues are valuable and the private parties involved include A. Gibbs and Sons, Oresund, Ivigtut Cryolite Mining and Trading Company (Series I, II, and III), the Royal Greenland Trade Company, and the Greenland Mining Limited. . Danish Colonial Milled Coinage debut in 1926 with the introduction of Copper-Nickel Ores showing Crowned Arms of Denmark in Obverse and Polar Bear and Date in Reverse. The issue catalogs for around $50 BU. Coins $10 and up Recent UNC Animal Kroners starts around $10. Bronze Medals from the 1970s start around $50. 1926 Polar Bear Issue in VF starts around $100. Paper Money $100 and up Kroners from the 1950s in VF starts around $100. Early 20th century Kroners and Specimen varieties go well into the 100s. Visitors tend to gravitate to carvings in walrus ivory, reindeer antlers and soapstone while seeking souvenirs from the place. Maps $5 and up Early 20th century maps start around $5. Eighteenth century maps including engraved color varieties start in the 100s. It can go into the 1000s for authentic 17th century maps. Art $5 and up 19th century landscape prints start around $5. Art posters on canvas and prints of fauna start around $15. Native Inuit carved figures start into the 100s. Curios $20 and up Indigenous Art Pieces start around $20. Nummite mineral samples start in the 20s. Natural Mineral Gemstone Cabochons from Kakortokite, Chalcothallite, Nuummite, etc and certain native Inuit Tupilak curio pieces start in the 100s.